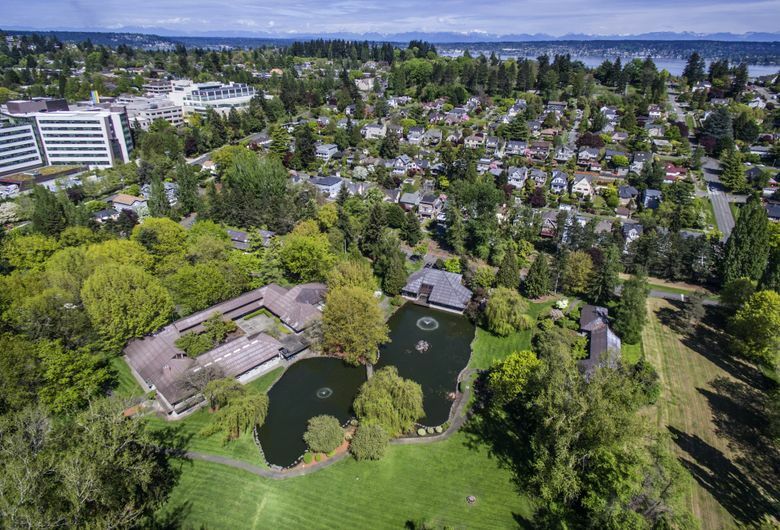 In built-out Seattle, a huge pocket of undeveloped private land is going up for sale in a prime neighborhood, with the rare potential to build a big batch of single-family homes or a research center — but only if the buyer can overcome concerns from the city and neighbors. The parklike Talaris campus in Laurelhurst spans 17.8 acres between the University of Washington and the hospital complex of Seattle Children’s. Originally built for Battelle Memorial Institute in the 1960s, it later became home to the Talaris Research Institute, an organization that was sold off in 2012. It now holds a small conference center, offices and a lodge, but the vast majority of the land is green open space and water. The company running the conference center calls it “Seattle’s best kept secret” — hidden behind large trees and a fence on back streets, next to quiet single-family homes, and a popular spot for wildlife. 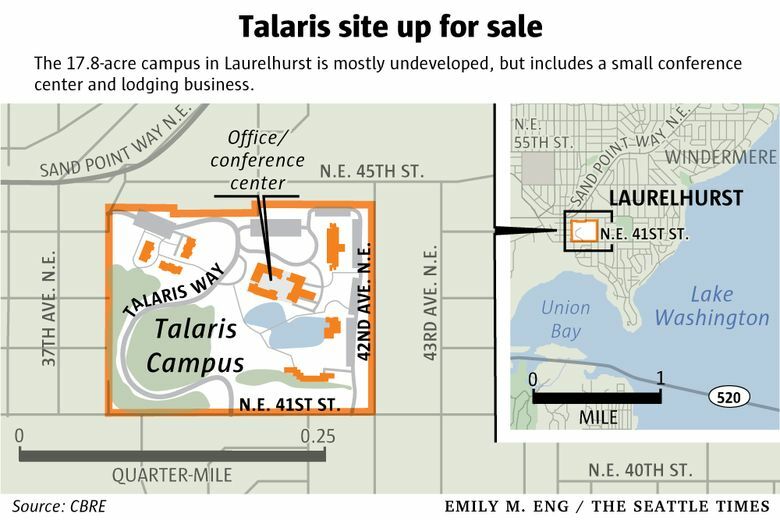 Last week, the property’s owner — an entity linked to telecom billionaire Bruce McCaw, who funded the Talaris Institute — put the property up for sale, noting the campus was ripe for potential redevelopment for homes or a research institute. There is no asking price. Tom Pehl, a senior vice president at CBRE, which is selling the property, said the firm has already fielded “significant interest” from potential buyers. He said it’s one of the largest, continuous swaths of land in the city owned by a private firm. The interest isn’t surprising given that home prices are rising faster here than anywhere in the country, while developers have virtually run out of land to build new houses. “It’s a logical conclusion that the homebuilders would be all over this,” Pehl said. “But we do have foreign and domestic institutional-type uses looking at it” for education or research facilities. In theory, the site could fit 80 to 90 single-family homes on 5,000-square-foot lots, or some sort of research institute run by a nonprofit, or a combination of the two. But the property is no guaranteed cash cow. When the owners tried to develop the site in 2013, the idea met with fierce opposition from the Laurelhurst community. Area residents for years had been free to stroll through the tranquil grounds, until the site was closed to the public earlier this decade. The owner’s previous effort to rezone the area to allow for as many as 300 apartments also failed, as did prior redevelopment attempts by other owners. Pehl said the exact limitations on development remain to be worked out between the new owners and the city. He said the value of the land comes with not only its unusually large size but its single-family zoning — residential neighborhoods that are, by and large, already built to the max in Seattle. He expects to find a buyer within about two months. She said past ideas for major development, like to build 200-foot-tall residential towers, were a no-go among residents of the low-slung neighborhood — they also previously helped block taller buildings planned by Seattle Children’s — but she’d be open to something with a smaller impact like single-family homes. The owners will “have to decide on the balance between the reasonable return on the investment and their commitment to the community,” she said. Bonnie McGregor, who operates the Orion Center for Integrated Medicine at the Talaris campus, said it is frequented by wildlife ranging from coyotes to ducks. She often pulls into her parking spot and takes a minute to breathe in “the peace of this place” before starting work, she said. The city Department of Neighborhoods, which oversees the landmarks board, was closed Monday and officials did not respond to emails seeking comment. CBRE said it could not make the property owner or a representative available. But Pehl said he has not received any instructions from the owner to prioritize bidders that keep any portion of the site intact. The current owner bought the property for $15.6 million. The county assessed the property at $14 million, though development would make the site much more valuable. CBRE notes in marketing materials that the average house in the area costs $834,000. The owner most recently planned to build 82 houses on the site. At such a price, those homes would sell for a total of $68 million, assuming they could get past the city’s landmarks board and neighborhood concerns. Seattle rarely sees new single-family houses — most are built one at a time, to replace torn-down, older homes. In all, Seattle has seen a net increase of just 2,700 single-family homes over the last 12 years. At least two nonprofits said they’ve also expressed interest in the site. The Academy for Precision Learning put together a concept plan for an education center and transition-to-work services hub for autistic youth at the site. Officials with the academy said they submitted a bid to the owners already. The Harmony Hill Retreat Center in Union, Mason County, which helps people affected by cancer cope with emotional stress, is also interested in the property, saying it would provide a chance to reach patients who don’t want to travel outside the city but still want a tranquil setting.